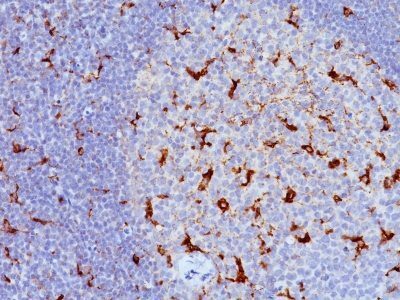 This antibody recognizes a glycoprotein of 110 kDa, which is identified as CD68. This antibody recognizes a glycoprotein of 110 kDa, which is identified as CD68. It is important for identifying macrophages in tissue sections. It stains macrophages in a wide variety of human tissues, including Kupffer cells and macrophages in the red pulp of the spleen, in lamina propria of the gut, in lung alveoli, and in bone marrow. It reacts with myeloid precursors and peripheral blood granulocytes. It also reacts with plasmacytoid T cells, which are supposed to be of monocyte/macrophage origin. It shows strong granular cytoplasmic staining of chronic and acute myeloid leukemia and also reacts with rare cases of true histiocytic neoplasia. Lymphomas are negative or show few granules. Catalog number key for antibody number 0685, Anti-CD68 (C68/684 KP1) The prefix indicates conjugation, followed by the antibody number and size suffix. Pulford KA et. al. Journal of Clinical Pathology, 1989, 42(4):414-21. | Warnke RA et. al. Am J of Pathol, 1989, 135:1089-95.